In March 1977, Williams assembled the 84-piece London Symphony Orchestra at Anvil Studios, Buckinghamshire. Together they recorded the Academy Award-winning soundtrack to George Lucas' Star Wars. Legends were forged in '77. 41 years later, the LSO reconvenes*1 17-or-so miles away at London's Royal Albert Hall under the auspices of conductor Ludwig Wicki, for a series of special screenings of that original film. While the audience watches adventure unfurl in front of them, a live orchestral performance takes place on the stage beneath. The cinematic circle is now complete. The capacity audience quietens and the house lights lower. While nothing can be heard over the live reproduction of Alfred Newman's 20th Century Fox fanfare, what's even more powerful is the feeling in the air of goosebumps raising on 5,000 pairs of arms. A brief round of applause erupts while the blue-on-black title card sets the galactic scene, then we're off. 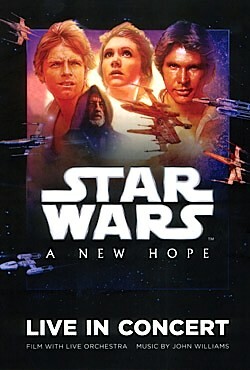 Whereas the promotional material and programme are graced with Drew Struzan's 1997 Star Wars Special Edition artwork, the version of the film which plays is the 2011 Blu-ray cut, for optimum picture quality (and Artoo hiding behind magic rocks, admittedly). And what an amazing ride this is. Star Wars in its purest form, yet wholly unique. But beneath the novelty of of this cinematic/concert duality lies the clinical co-ordination which makes it work as a package. Soundtracks are recorded over weeks, not hours, and are rarely designed to be played live in continuous succession. A musician's precision is as important as their stamina*2, here. This concert has to 'run to time' and dovetail perfectly with the events on screen. No drift is permissible, neither fast nor slow. As noted above, John Williams' cues are characters in themselves, and need to enter and exit the stage right on time, just like the actors. And because this isn't a regular track-by-track performance, there are no real gaps for the audience to applaud again until the end of the first half, the beginning of the second and the closing credits*3. The show comes with an interval once the Millennium Falcon docks in the Death Star, a chance for the audience to reflect on their experience so far and the players to take a proper break (re. the earlier point about stamina). As with any finalised production, the other craft to admire is the mixing. Although the soundtrack appears at the same moments and with the same levels of intensity as the version of the movie we all know, great care is taken to preserve the balance between the pre-recorded film audio and the live music. 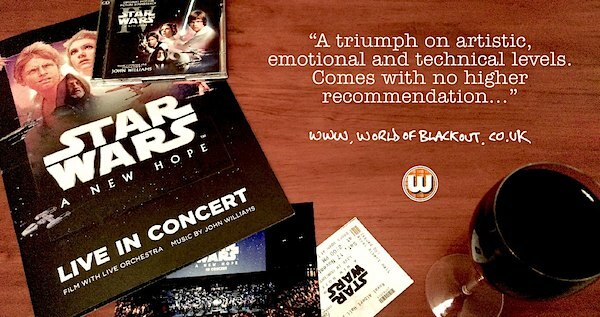 As was John Williams' original intention, the orchestra are here to enhance the film, not overpower it. Anyone watching Star Wars for the first time in this setting would enjoy it for all the same reasons, cinematically. The only parts of the score not covered live are the two diegetic tracks played inside Chalmun's Cantina by Figrin D'an and the Modal Nodes. It's unclear whether this is because the instruments required for the calypso/jazz fusion aren't part of the standard orchestral setup, or just because the volume and structure of this music changes frequently as crucial dialogue is layered over the top. Either way, it's a chance for the performers to take a short breather before the action resumes (and in the case of the brass section, for some members to cheekily crane their necks and watch five minutes of the movie). What's perhaps most surprising is how many short stretches of the film - many with key moments - feature no music at all, relying instead on dialogue and Ben Burtt's array of immersive sound effects, as all motion ceases from the orchestra but for the turning of pages. An extra frisson of excitement comes from seeing the string players ready their bows toward the end of a quiet scene, or watching the light from the screen catch the brass instruments as they're raised into position. The most challenging part is not getting caught up in the film then forgetting that this is first and foremost a concert. Because in the thick of battle, whether it's the dust and grit of Tatooine or the echoing hallways of an armoured space station, the intrinsic link between the story, atmosphere and score is indistinguishable from 'the real thing'. Because this is the real thing. From start to finish, Ludwig doesn't speak to the audience. That isn't needed. He and the LSO speak for themselves, and for John Williams, in their own collective and distinctive voice. Structurally, other events in the In Concert series. Although it's not a cheap night out. If this were available on watch-at-home formats, I'd be on it like a mynock on an unshielded power coupling. Most people stopped trying to disagree with me in pubs about Star Wars many moons ago. …but if you wanted to go round the houses with it, Ludwig Wicki conducted the score for Jurassic World 2, a flick that featured Kamil Lemieszewski, who also appeared in that King Arthur film alongside Geoff Bell, the actor also known for his work in RocknRolla, which starred Thandie Newton who was of course in Run Fatboy Run alongside Peter Serafinowicz, who was in Guardians Of The Galaxy with Spencer Wilding, who rocked up in Jupiter Ascending, a movie whose score was conducted by… Maestro Ludwig Wicki.